Leah Hogsten | The Salt Lake Tribune Hip-hop artist Chali 2na and his band, House of Vibe, will headline the eighth annual Urban Arts Festival, Sept. 15-16 at the Gallivan Center in Salt Lake City. 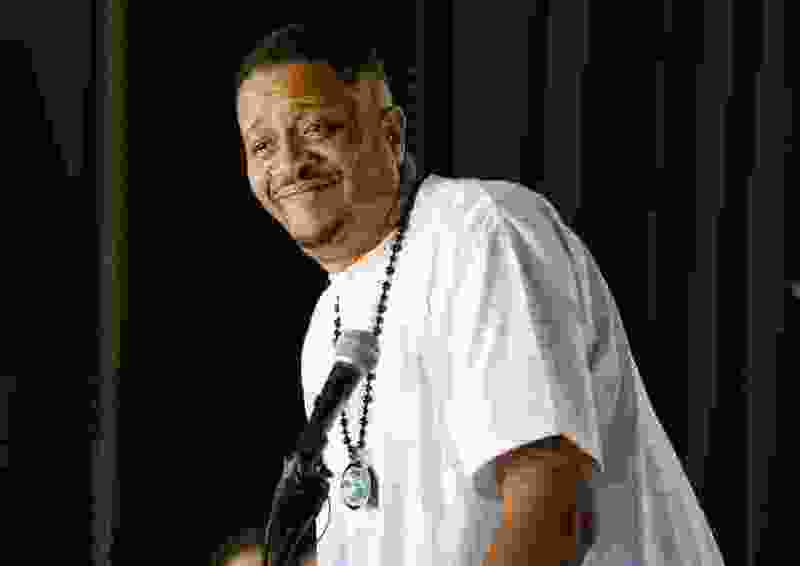 Chali 2na is a member of Jurassic 5, a popular hip-hop group, and is known for his rapping style. The two-day festival features artists, music, dance performances, live street painting, fashion, artist talks and a basketball competition. For pioneering rapper Chali 2na, painting and music have always been intertwined — so it makes sense that he’ll be doing both as the headliner of September’s Urban Arts Festival in Salt Lake City. “What led me to my [music] job was graffiti art,” Chali — a founder of the legendary bands Ozomatli and Jurassic 5 — told reporters at a news conference Friday at the Gallivan Center, which will be the venue for the festival Sept. 15–16. Chali and his band, House of Vibe, will take the stage to cap off Saturday’s music performances. Then, on Sunday, he will give a live painting demonstration on the Gallivan grounds. 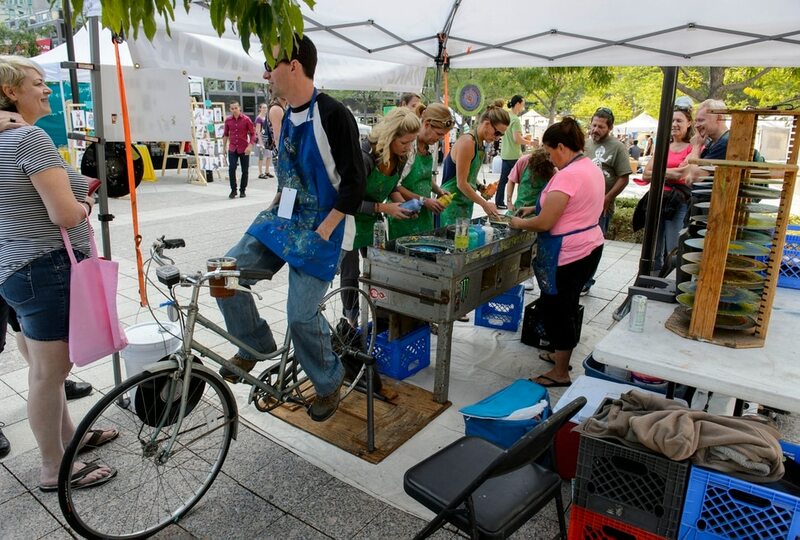 The two-day event, billed as the largest free art event in Utah, will feature more than 40 local and regional music groups; dance performances, including breakdancing battles; a 3-on−3 street basketball tournament and slam-dunk contest; plus food trucks, a kids’ art area and some 150 artist vendors. New to this year’s event, said festival director Derek Dyer, is “digital graffiti,” a dozen virtual art installations that will be viewable on visitors’ smartphones through an augmented-reality app. Also new is an urban fashion show. Festival organizer Kim Angeli said the show will feature 10 designers, “looking at urban life as the fashion medium,” and featuring recycled and “upcycled” materials. 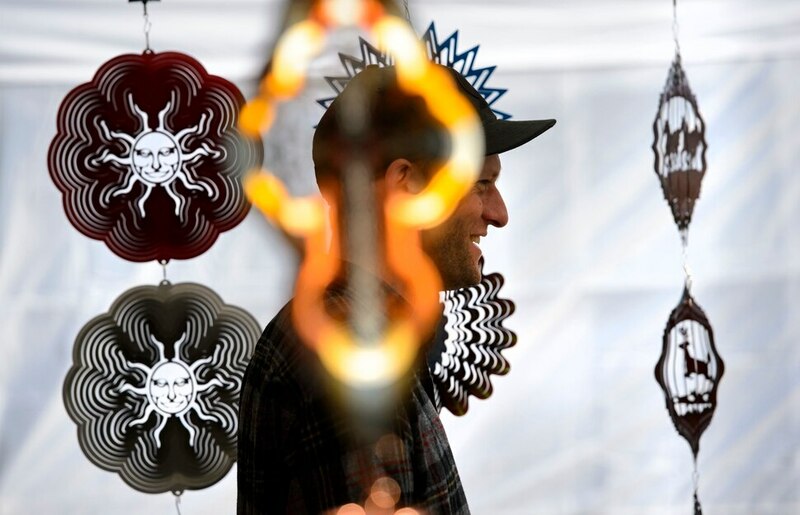 (Steve Griffin | The Salt Lake Tribune) Artist Jonathan Magee of the Oregon Wind Spinners talks with festival goers as his art flashes reflected light as they spin during the Urban Arts Festival at the Gallivan Center in Salt Lake City Sunday September 17, 2017. The two day festival featured artists, music, dance performance, automotive arts, projection art, virtual reality and new media arts. 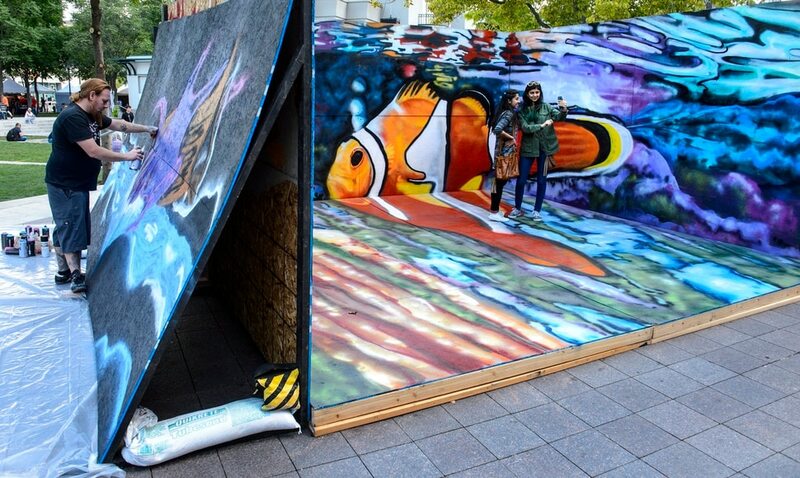 (Steve Griffin | The Salt Lake Tribune) People take photos in a giant mural during the Urban Arts Festival at the Gallivan Center in Salt Lake City Sunday September 17, 2017. The two day festival featured artists, music, dance performance, automotive arts, projection art, virtual reality and new media arts. (Steve Griffin | The Salt Lake Tribune) People use liquid paints as they make spin art during the Urban Arts Festival at the Gallivan Center in Salt Lake City Sunday September 17, 2017. The two day festival featured artists, music, dance performance, automotive arts, projection art, virtual reality and new media arts. (Steve Griffin | The Salt Lake Tribune) People use liquid paints as they make spin art during the Urban Arts Festival at the Gallivan Center in Salt Lake City Sunday September 17, 2017. The two day festival featured artists, music, dance performance, automotive arts, projection art, virtual reality and new media arts. (Steve Griffin | The Salt Lake Tribune) Nola Miller, Morgan Valentine, Erin Spencer, of the Utah Mermaids visit with people during the Urban Arts Festival at the Gallivan Center in Salt Lake City Sunday September 17, 2017. The two day festival featured artists, music, dance performance, automotive arts, projection art, virtual reality and new media arts. The professional mermaids can be hired for party's and events and also do environmental awareness. (Steve Griffin | The Salt Lake Tribune) Poutine Fries is on of several food trucks at the Urban Arts Festival at the Gallivan Center in Salt Lake City Sunday September 17, 2017. The two day festival featured artists, music, dance performance, automotive arts, projection art, virtual reality and new media arts. (Steve Griffin | The Salt Lake Tribune) People are fascinated by the Oregon Wind Spinners as the flash reflected light as they spin during the Urban Arts Festival at the Gallivan Center in Salt Lake City Sunday September 17, 2017. The two day festival featured artists, music, dance performance, automotive arts, projection art, virtual reality and new media arts. There’s plenty of crossover between music and painting for Chali, but never at the same time. “It’s hard to listen to my own music when I’m painting,” he said, though he will listen to other people’s music. “When I’m painting, I can’t really engage in recording, but I come up with the craziest ideas for music when I’m painting,” he said. Chali, born Charles Stewart, is known for his rapid-fire raps and his deep baritone. He took his rap name from another deep-voiced character, Charlie Tuna in the StarKist tuna commercials. In 1993, he was one of the founding members of the alternative hip-hop group Jurassic 5, which recorded four albums before breaking up in 2007. The band reunited in 2013. Chali and Jurassic 5 turntablist Cut Chemist were also founding members of the Latin/hip-hop/rock group Ozomatli in 1995, though both had left after the band’s second album. Chali said he has been working for 10 years to combine his music and painting. His appearance at the Urban Arts Festival will be a beta test for a tour he’s planning this fall, where he will perform a concert and open an art exhibit in each city. The 8th annual Urban Arts Festival, encompassing street culture in music, visual art, dance, food, digital, basketball, fashion and food.